I’m not trying to be nosy, but could e-mail me your approx cost to build. Material and Labor if possible. 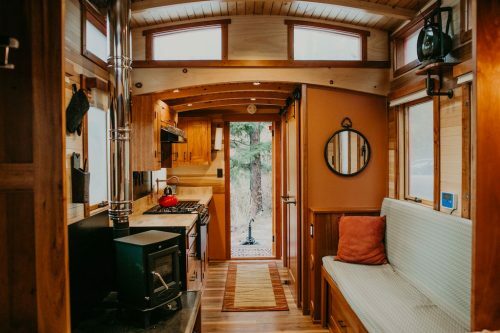 LOVE this tiny home. I have never liked the barrel shower stall. I would think it will eventually create issues, not worth it. 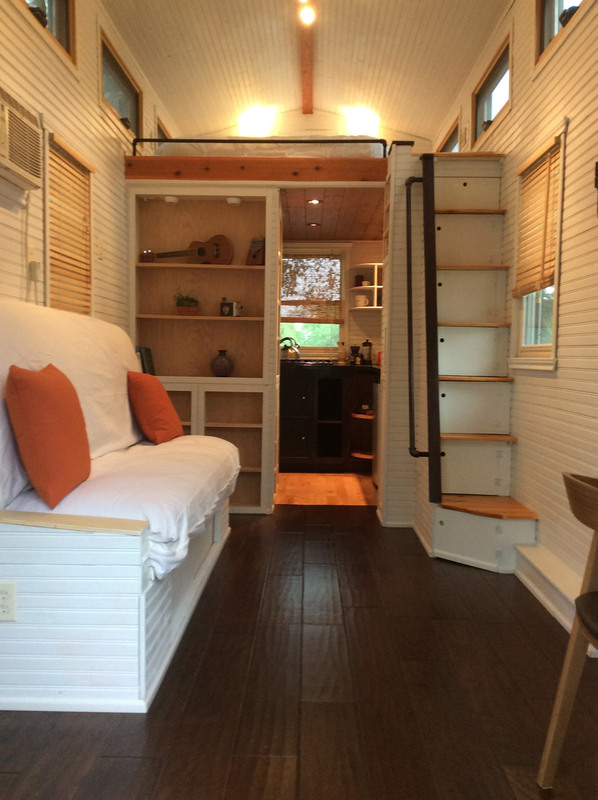 do you have anything in ny city for tiny houses? Have seen this before & absolutely love it. 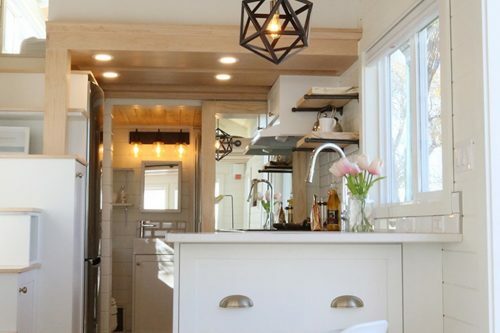 For me personally, I’d use natural wood throughout, but it’s lovely. 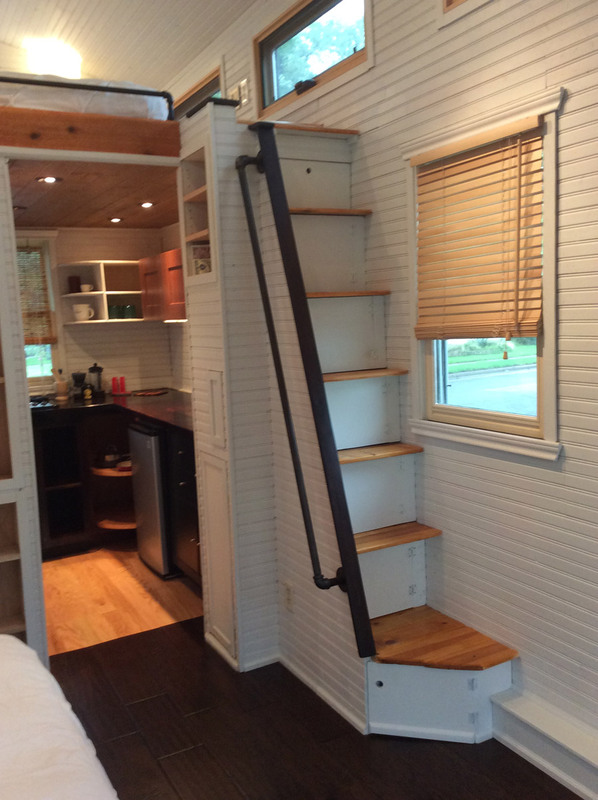 I like this layout quite well, and I try not to criticize stairs in these loft models, but these just seem so steep and unsafe, especially for egress. How do you climb down those? I suppose the word is, “carefully.” I would add corner bead where the wall panels meet to make a cleaner corner. Lots of usable space. 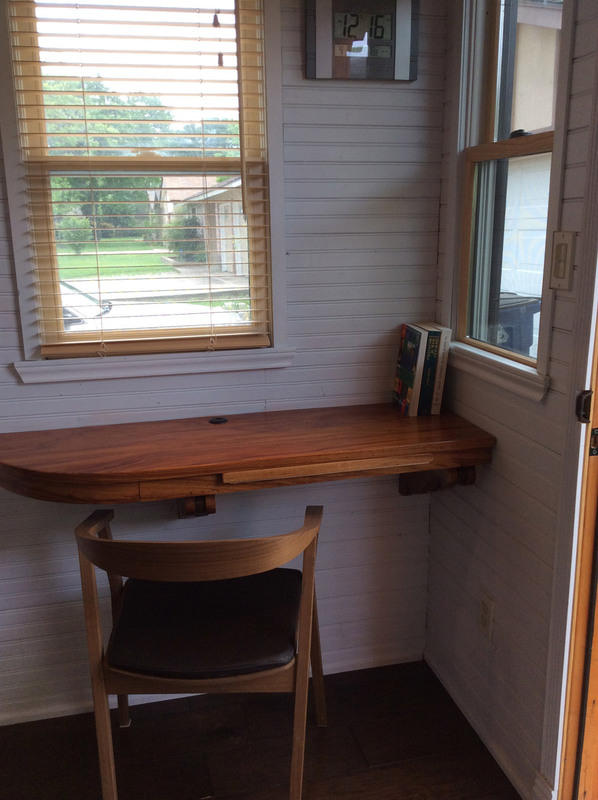 That corner desk has a great design and finish to it. Neat. There are lots of wonderful features to this build: I love the spaciousness of the master loft and the track lighting. 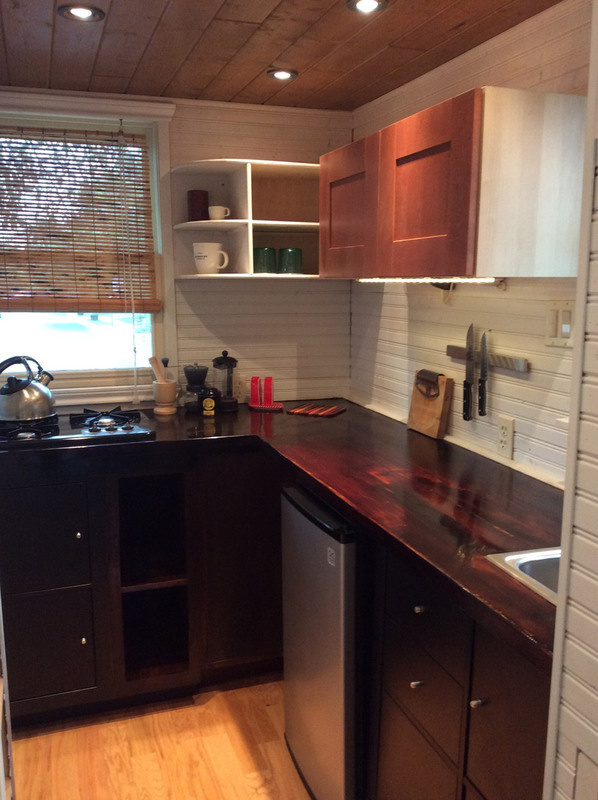 I really like the kitchen; it feels cozy and efficient; nice color on the counter and lower cabinets finish. I’m always a fan of storage stairs and this build is wise enough to put in a banister for safety. The corner desk is very nice but since the back of the chair seems to clear (under) the desk top, I’d make it a little deeper for computer, monitor, books and papers. 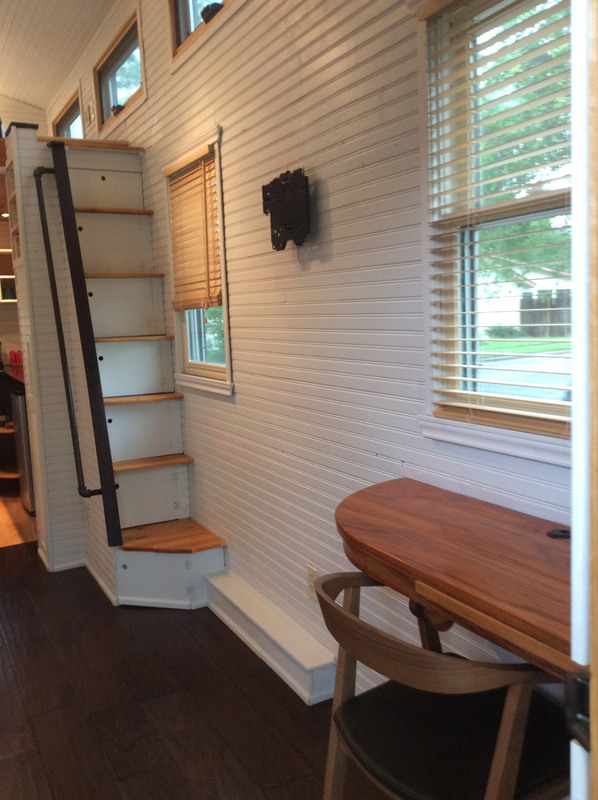 I really love the built-in banquet with sliding doors underneath for storage (very kewl). I love the bookcase for display items or ones library. The only thing I couldn’t live with is the wooden tub in the bathroom; I don’t think they are as sanitary as a porcelain tub that can be scrubbed down with bleach. The outside of this build is very attractive in an inviting au naturel way. 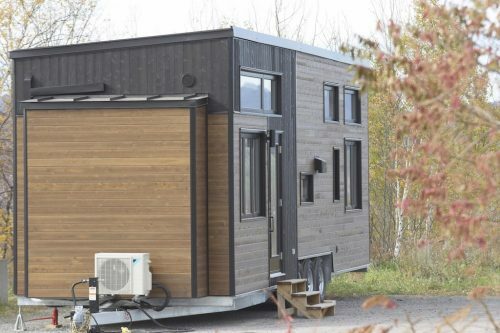 I give high marks to any build, floor plan or decor that takes the eyes and mind away from the fact that this is just a box. Some builds cause one to become intensely aware of the box itself and nothing else seems to relieve the effect of this center stage fact. But here, we have a charming and inviting space with great cozy ambience that is most desirable for ones ‘home’ environment. beautiful house but chemical free is impossible. This is one of my favorites. 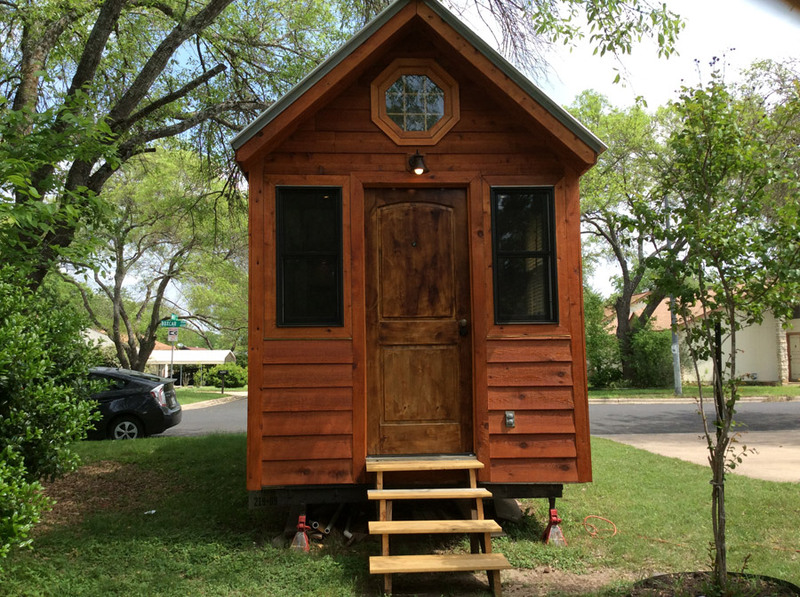 My only critique, and one I have for so many tiny houses is the “dormer” roof for the loft. That space above the door is basically worthless in this house and many others due to the steep angle of the roof, and the miniscule triangle of space it encloses. If the entire ceiling was the same height and angle as the loft, then you could have much more useable storage space. Everything is soooooo well thought out except for that one detail. 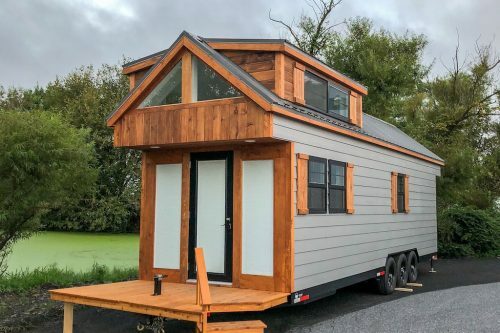 I get it; it’s an aesthetic choice, but if we’re already thinking outside of the norm of a traditional home, why not go all the way and just eliminate that vestigial peaked dormer and make full use of the space? Use the loft as is or close it off as a couple of closets, or one big one for bulky items or seasonal things that you need, but don’t want to look at all of the time.